WELCOME MELISSA FROM MAHLICADESIGNS! MELISSA IS A FELLOW COLORADOAN WITH A GREAT EYE FOR DETAIL AND A LOVELY SENSE OF HUMOR. LET’S SEE HOW SHE INTERPRETED THE COFFEE AND COCKTAILS THEME! Thank you Elizabeth for having me today for the Day and Night Dress Challenge; Coffee and Cocktails edition. I’m Melissa of mahlicadesigns. Deciding on my Coffee Date dress was easy. I’ve been wanting to make another Shoreline Dress after loving the first one I made last summer. The dress is just so right for me in many ways. 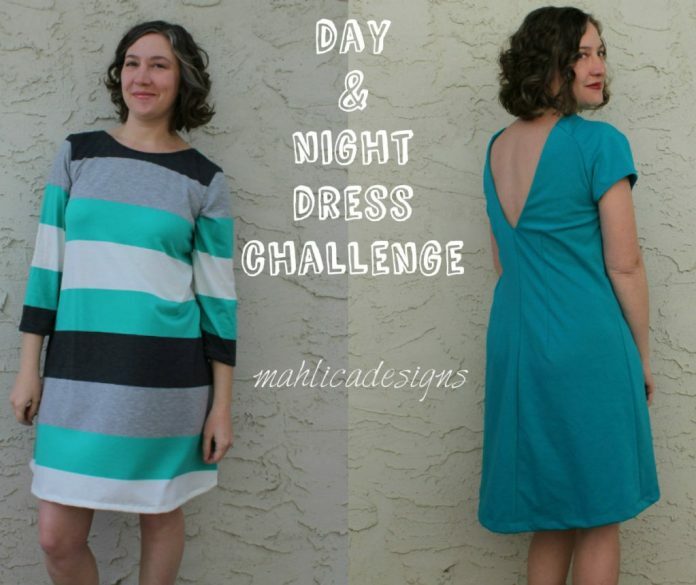 It’s easy to sew, easy to wear, and has a great shape without being too fussy. The Pattern: Shoreline Boatneck Dress from Blank Slate Patterns in size medium. Instead of shortening the dress for my height, I actually used the longest tunic length to take advantage of the narrower sweep at the hemline and then lengthened the tunic by about 1.5in at the waist. The Fabric: Seaglass striped rayon/lycra from Boho Fabrics (now sold out). Perhaps I’m not very original, but I loved the striped version I made last year, so I’m sticking with stripes again. I chose the rayon to see how the drape would look compared to my cotton/lycra version. I’m totally pleased with my Coffee Date dress. Now, who’s up for a meetup to chit-chat about sewing? Deciding on my cocktail dress was a struggle. I worried that my choice wouldn’t be worthy of the fancy description I imagine when I think cocktail party and yet still work for my unfancy life. After hemming and hawing, I finally just moved forward with making M7628, a pattern I’d been wanting to try for some time. I choose a Jade ponte from Stylish Fabrics to make it up. The Jade looked so rich and luxurious, that I just had to have it for my cocktail dress. I was drawn to the pattern by the short raglan sleeves, the set in waistline, and the deep V in the back. After completing the dress though, I feel like I have a mullet dress. Fun party dress in the back and a vintagey office look in the front. The Pattern: McCalls 7628 in size 12. I had to take in the bodice at the side seams significantly to get rid of the boxiness and help with the gaping underarm. In the end, I believe I have a size 8 bodice grading out to size 12 at the hips. I also needed to pinch out some extra fabric at the back sleeve seam to remove some gaping at the back. The Fabric: Jade ponte from Stylish Fabrics*. The fabric is wonderful and I love sewing with ponte. Ponte is easy to sew with, is stable enough to work for a lot of projects, and has enough stretch to make those projects comfy to wear. Overall, I just don’t know what to think of my cocktail dress. I love the back, but I have no idea how to make the front more party worthy. Have you ever made a mullet project? What did you do to even out the split personality? *Many thanks to Stylish Fabrics for providing the Jade ponte for my cocktail dress. STYLISH FABRIC IS OFFERING 25% OFF OF THE JADE PONTE TO ANYONE INTERESTED IN MAKING THEIR OWN PROJECT INSPIRED BY MELISSA. JUST TYPE IN THE CODE: “MELISSA” TO APPLY THE CODE TO YOUR ORDER AT STYLISH FABRIC.